Some of the year's highest tides will hit California shorelines this week and they're predicted to reach 7 feet in some areas. 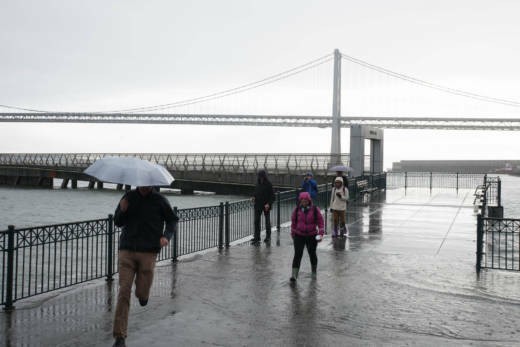 Strong winter high tides, known as king tides, happen annually in certain coastal and low-lying areas like Highway 101 near Lucky Drive in Marin County and the Embarcadero in San Francisco. King tides occur when the moon, sun and Earth are so close together they create a strong gravitational pull that produces the greatest tidal effects of the year. On an average day, these king tides reach further inland than the highest ordinary tides, which can inundate roads and cause huge swells along the beach. "It’s not going to be a massive danger to people but in certain low-lying areas people will see flooding," says Marina Psaros, co-founder of King Tides Project. Psaros says spots in Mill Valley near Highway 1 can flood; in Pacifica, flooding is common, as is cliff erosion during big storms. Currently, one of the beaches in Pacifica is closed indefinitely because of a sinkhole that just opened Saturday on a cliff in the area. The National Weather Service advises residents not to travel through flooded roadways or leave your vehicle in a low-lying parking lot near the coast and says to avoid narrow beaches and coves where your entry or exit could be blocked by rising waters. Psaros says rising water levels offer the opportunity to glimpse the future. "They [king tides] happen every year and it really helps us know what’s going to be underwater in the future with sea level rise," says Psaros. Her organization is asking Californians to submit their king tide photos on Twitter using the hashtag #kingtides. These crowd-sourced photos help NASA and USGS scientists use real life data to validate sea level rise and climate change models.